Join thousands of others and subscribe to receive weekly updates and get a chance to win the KetoDiet App! KetoDiet is a health and food blog dedicated to low-carb, paleo / primal living. The KetoDiet approach is simple: It's a low-carb diet where the focus is on eating real food. With the growing popularity of low-carb diets, the food industry introduced foods that may be low in carbs but are laden with unhealthy ingredients such as artificial sweeteners, preservatives and other additives. You won’t find any these in my recipes as you won’t find grains, sugar, potatoes, legumes and unhealthy oils. How about raw dairy, is it allowed? It's up to you whether you include it in your diet. Unless you are dairy intolerant, you can include cheese, full-fat cream and yogurt in your diet plan. That's why several of my recipes offer dairy-free options. KetoDiet is not just about losing weight at any cost; it's about adopting a healthier lifestyle. What is the Ketogenic Diet? What is the Paleo / Primal Diet? The ketogenic diet is a high-fat, moderate protein, low-carb diet. It's a diet that causes ketones to be produced by the liver, shifting the body's metabolism away from glucose and towards fat utilisation. The ketogenic diet is an effective weight loss tool and has been shown to improve several health conditions such Alzheimer's, Parkinson's, epilepsy and even cancer. In fact, you don't need to strictly follow a ketogenic diet to lose weight. Low-carb, paleo and primal diets have all been shown to help people shed extra pounds. Apart from managing weight, ketogenic diets have been used for treating epilepsy and other neurological diseases since the 1920's. The paleo / primal diet is based on the idea of eating foods humans consumed to for thousands of years of evolution, especially during the hunter-gatherer era. Foods like meats, eggs, nuts & seeds and fruits & vegetables are paleo-friendly, but you should avoid grains, legumes, artificial sweeteners and processed foods. It depends. You should only consume alcohol when maintaining your weight (not losing) and it must be sugar-free. Although some bloggers and authors distinguish between the "paleo" and "primal" approach, myself and many others use these terms interchangeably. I do sometimes use raw dairy in my recipes but include dairy-free alternatives when possible. What's the Difference Between Paleo & Primal Diet? Strictly speaking, a paleo diet is high in protein, moderate in fat, low in carbs and does not allow dairy. A primal approach usually refers to a diet high in fat, moderate in protein, low in carbs and allows raw full-fat dairy like butter, cream, and cheese. If you are new to the ketogenic diet, everything may seem really complicated. In fact, once you get used to ketogenic / low-carb living and learn about keto-friendly foods, it will become a lot easier. Here are some tools to help you understand everything about this life-style: what to eat, what to avoid and how to make sure you reach your goals. 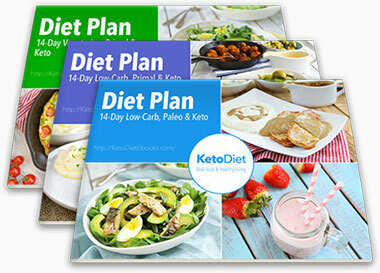 Practical Guide to Keto & Paleo Diet is a simplified version of the guide from my apps and book. 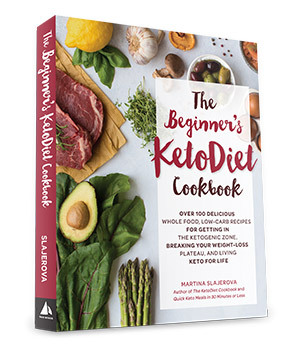 It covers all you need to know in simple terms and will help you understand how the ketogenic diet works, what to eat and what to avoid. You'll find everything you need to know about ketogenic nutrition, including how many carbs, protein and fat you should be eating. Everything is backed up with scientific references for those who want to know more. You'll also find advice on what to do if you reach a weight loss plateau, what is keto-flu and how to avoid common mistakes. You can find a complete list of all my free and premium diet plans here. I created several diet plans that are suitable for anyone: keto/ paleo, keto/ primal, keto/ vegetarian diet plans! All diet plans include a shopping list and easy to make recipes so you won't have to spend too much time in the kitchen. To help you find your ideal macronutrient intake, we developed a free online keto calculator, KetoDiet Buddy - try it now! Reaching a weight loss plateau have several causes, and you don't necessarily have to be eating too much. In fact, you may discover that you haven't been eating enough. In my experience, losing body fat becomes more and more difficult as you get close to your target weight. Keep in mind that these calculations are estimates and small differences won't impair your weight loss efforts. More than likely, you have different energy requirements every day, so what really matters is the long-term average, e.g. over a week, not your daily values. 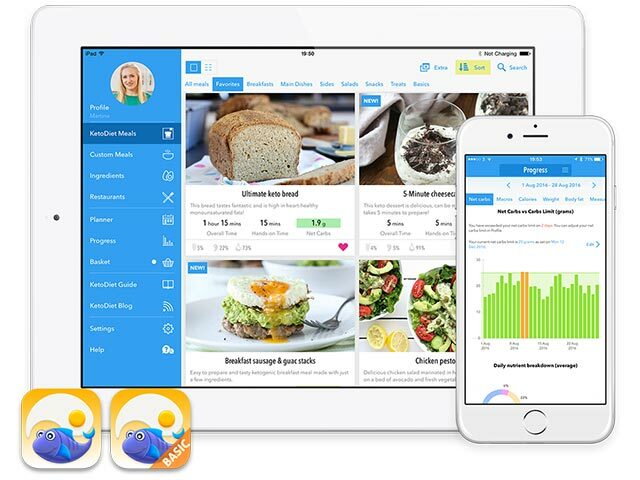 KetoDiet Basic for the iOS (iPad and iPhone) and Android devices is designed for people interested in healthy low-carb recipes and complete diet guidelines. Hundreds of exclusive low-carb, paleo/ primal recipes plus a wealth of new recipes that are added to our integrated blog. The most complete guide to the ketogenic diet. You'll learn everything you need to know about the diet to help you make the right choices. Awesome diet planner allowing you to use meals from the App, blog, and even your own custom meals. Accurate restaurant meal database that we update frequently to help you choose the right meals when eating out. KetoDiet is an on-going project I started with my partner in 2012 and includes KetoDiet for the iPad, KetoDiet Basic for the iPhone and iPad and The KetoDiet Cookbook. When creating recipes for KetoDiet, I don't focus just on the carb content — you won't find any processed foods, unhealthy vegetable oils or artificial sweeteners. My recipes are all grain-free, sugar-free and gluten-free. Most of my recipes are paleo-friendly or include paleo-friendly alternatives (e.g. some recipes contain raw dairy which is considered paleo / primal). It doesn't matter what type of a low-carb diet you follow, KetoDiet is suitable for paleo / primal diet, Whole30 any many other! 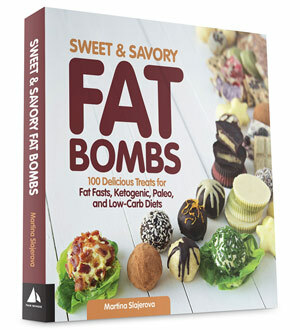 My Sweet & Savory Fat Bombs Book, is a must-have for everyone who wants to follow a healthy keto diet. Apart from sugar-free treats, you'll find several delicious savory low-carb snacks that are low in carbs and high in healthy fats. What are fat bombs? Fat bombs are snacks high in fat, low in protein & carbohydrates. You can use them to boost your fat intake in order to meet your macronutrient targets. At least 80% of the calories in the recipes in this cookbook come from healthy fats, which makes them ideal when you need to boost your fat intake without going over your protein and carb targets. Fat bombs are handy when you don’t have time to cook and need a quick source of energy. I love using them as workout snacks instead of “regular” foods high in carbs. Lastly, you can include them in your diet plan when you follow a fat fast. Life gets busier and busier. People spend more time at work and less time with their families. Cooking and eating together has become a rare occasion. Eating healthy without spending hours in the kitchen has been challenging for most of us. 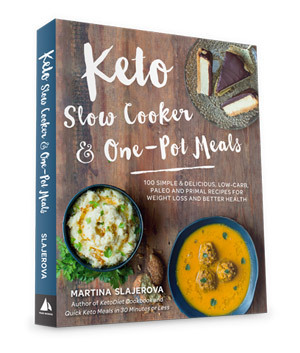 Keto Slow Cooker and One-Pot Meals includes over 100 delicious slow cooker recipes and one-pot wonders. 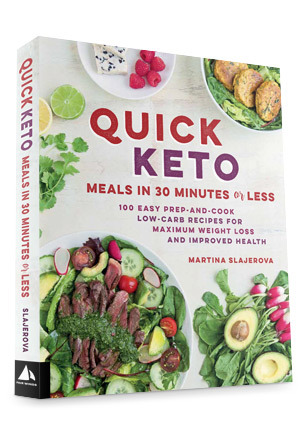 Additionally, you will find 25 quick-prep keto basics including condiments, spices and stocks. On the other hand, with more resources becoming available, more misinformation has been emerging, making it hard to distinguish personal opinions from facts, and myths from truths. We simply live in a world of information noise. If you are new to the diet, it just becomes overwhelming. In my latest book I present science-based facts in a simple and accessible way so you can make informed decisions that work best for you. 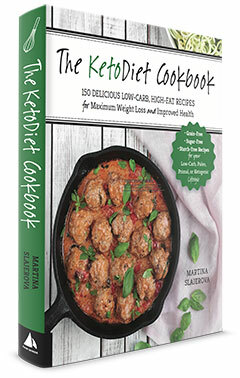 The Beginner's KetoDiet Cookbook is more than just a cookbook — apart from over 100 delicious recipes it includes an easy to follow guide to kick-start your diet. Click here to see the products I use and love! 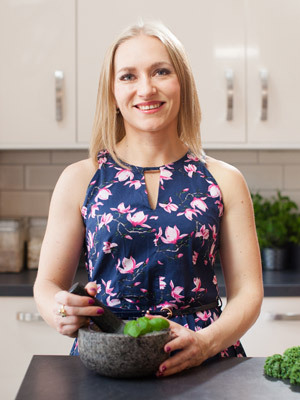 You'll find everything from ingredients I use on a regular basis to kitchen tools, appliances and even fitness & exercise products. Finally, is the Ketogenic Diet Suitable for Everyone? Ketogenic / paleo and other low-carb diets have been around for thousands of years. In fact, that's how we used to eat ten thousand years ago, before agriculture. However, we were not always in ketosis; this was determined by the season and availability of foods. There is no diet that fits all and you may need to make small adjustments to fit your needs. This means that people who have allergies may need to avoid certain foods (dairy, nightshades, nuts, etc.). Also the amount of carbohydrates one's body tolerates is different for everyone. Some people do well on a very low-carb diet (such as below 20 g net carbs) while others benefit from a low to moderate amount of carbohydrates (30-50 g net carbs). It's totally up to you whether you want follow a very low-carb, ketogenic diet or add a small amount of carbs. If you want to lose weight, the secret to success is to remain in a fat-burning mode. Of course, the requirements are very different for those following the ketogenic diet for therapeutical purposes, such as managing cancer or epilepsy and those who simply want to lose weight. In fact, you can easily lose weight without the need to be in ketosis, as the main reason for healthy weight loss on a low-carb diet is appetite control, not the level of ketones in your body. Some people achieve great results on low-moderate carbohydrate diets. The best way to find out is to try it yourself and monitor your progress. If you want to learn more about carbs, have a look at my post here: Total Carbs or Net Carbs: What Really Counts? Additionally, there are other benefits of being in ketosis - not just weight loss. Personally, I don't follow a very low-carb diet and I'm not always in deep ketosis. It's still not clear whether a very low-carb diet is beneficial for everyone, especially those with pre-existing thyroid issues like me. My daily limit is 30-50 grams of net carbs which allows me to maintain a healthy weight, feel great and still be a fat-burner. It's also the most natural way of eating for me, as I don't have to restrict myself and can freely enjoy all sorts of berries and even dark chocolate. Most importantly, I feel great. In fact, I haven't noticed any benefits of eating 20 g net carbs or less (note that this is just my personal experience and reflects what works for me). If a low-carb, ketogenic diet is not suitable for you, I suggest you try the Autoimmune Paleo Approach (AIP) or a combination of AIP and a keto diet. Apart from grains and other foods not allowed on a keto diet, this approach eliminates foods that may negatively affect those with an autoimmune disease. While some people with an autoimmune condition may be doing well by simply avoiding gluten and eating low-carb, others may need to avoid more foods such as eggs, dairy, nightshades or nuts. I have an autoimmune disease myself and my health has dramatically improved by simply avoiding gluten and following a low-carb approach (30-50 g net carbs). Hi, I'm Martina - welcome to my blog and thanks for stopping by! I currently live in the UK. I hold a degree in Economics and worked in auditing, but I have always been passionate about nutrition and healthy living. I love food, science, photography and creating new recipes and I am a firm believer in low-carb living and regular exercise. As a science geek, I base my views on valid research and I have first-hand experience of what it is to be on a low-carb diet. Both are reflected on my blog, in my apps and cookbooks.